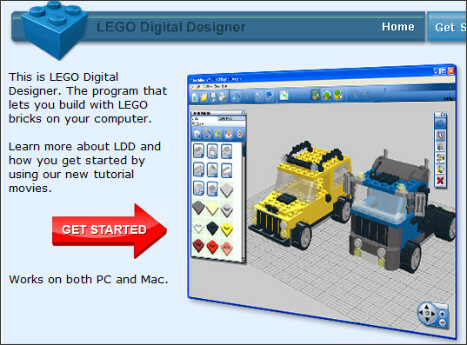 ICT Inspirations: Lego Digital Designer: Another LEGO based CAD environment. Lego Digital Designer: Another LEGO based CAD environment. This tool and free download has been all the rage in school recently. Discovered by a couple of our Y 6 students, who having used it at home managed to download, install and get it to run from one of the shared drive spaces on the network, it initially gained attention as the focus of some firm but I hope fair discussions about our acceptable use policy and argeement.... The ingenuity of it all! I hope you'll agree with the resolution, too good to miss as a tool, but also because I want our AUP to work within the realms of trust, I agreed to download and look into an installation of the tool for them to use, on the proviso that in future, they should share tools like this that they would like access to in school with me first. This situation was an ideal opportun ity to discuss the reasons why we do this and esafety issues such as licensing and copyright. 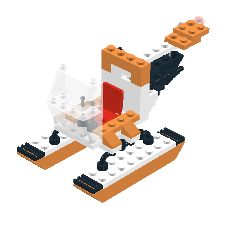 The Demo provided by the students and the brief play I have had with LEGO Digital Designer only scratches the surface of the potential uses I think it could have. It includes an extensive library of components that include Mindstorms and Creator kits. On a basic level the tool could be used in ways outlined in this previous post about the Freeware tool BlockCAD. Digital Designer is quite a different beast however, and with the inclusion of Technic and Mindstorms components could be used to support design work or recording from control activities using nxt. In addition the interface allows the user to switch betwen a number of different onscreen viewing modes. Building guide mode, where completed models can be put together step by step, using a walk/step through video presentation, or building guides exported in HTML format. My brief engagements with the tool don't as of yet I feel do full justice to this potentially powerful freeware platform. To get your imagination whirring and creative juices flowing I'd recommend you download it and check it out for yourself. Certainly the students who recommended it to me, J and T love it and this has got to be the best starting point for thinking about how the tool might be exploited further engage them. I would love to hear your thoughts, and ideas about where and how you might use the platform.